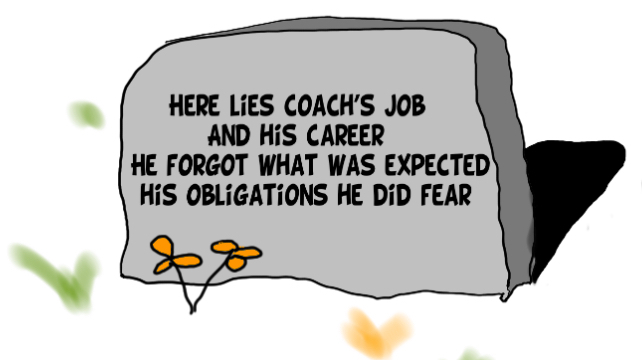 Coaches have two levels of employment. The first is the job. The second is the career. There are ways to kill both. Job-killers are actions which cause you to be fired. Career-killers are actions which make it improbable (or impossible) to get another job in your field. Coaches mistakenly think a specific event is the culprit when either of these happen. While both those statements may be true, it is dangerously narrow thinking. When we don’t do what is expected, we get fired, and someone who will meet the expectations will take our place. Once again, that simple. Actually it’s not simple, and this might help: Become The Coach They’d Love To Keep. Record the answers. If they are acceptable then incorporate appropriate actions into your workflows so you meet the expectations and obligations. And if their answers are not acceptable? Beware, as I note here (Why Sport Coaches MUST Protect Themselves). And then, find another job, since you will soon be looking for one any way. Happy Labor Day (if you live in a country that celebrates it). And the irony of this being posted on Labor Day is not lost on me. PS: If you find value in this, I’d be tickled pink if you’d share it with your social clan. Thanks.